Climateer Investing: Milestones: "Fed’s QE Unwind Reaches $501 Billion, Balance Sheet Falls Below $4 Trillion. 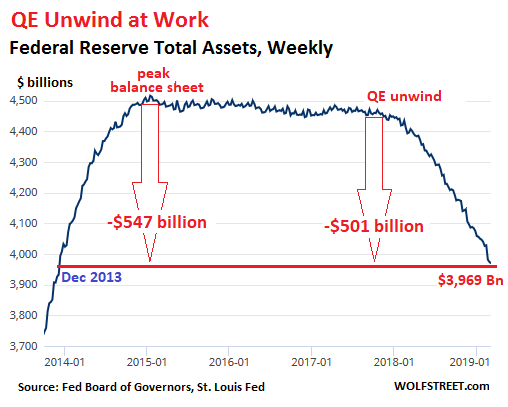 'Autopilot' Engaged "
Milestones: "Fed’s QE Unwind Reaches $501 Billion, Balance Sheet Falls Below $4 Trillion. 'Autopilot' Engaged "
Remember, the Fed is letting their holdings mature not selling into the market, so the transmission effect is more diffuse and delayed than when they were buying. There is an effect on the treasury who will have to issue debt to fund both the ongoing deficits and the paper that isn't being rolled but so far they seem to have found buyers. During peak-balance-sheet at the end of 2014, total assets ($4.52 trillion) amounted to 26% of GDP. Today’s assets amount to 19.4% of GDP. In the years before QE started, the balance sheet ran around 6% of GDP. With the U.S. following twenty years later. However, the idea of one final debt fueled party on the way out the door sounds like fun. "A Magician Explains Why We See What’s Not There"
"The Bezos '70 percent rule' for decision-making"
"The steady decline in transit ridership"
"When Can Yield Curves Fail As Indicators? " "Big data key for commodity traders’ future"
"A World Built on Sand and Oil"
"Berlin in the Golden Twenties"
"'The Fly' Shall Rise Again"
Just How Big Is Izabella Kaminska's Family? "Experts praise Norsk Hydro cyberattack response"
"Sizing up a Potential $30 Billion Ag Trade Deal"